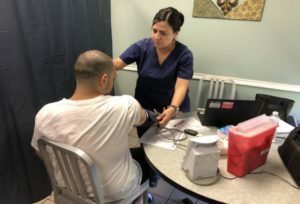 In late June, the Dismas Charities Laredo Texas Visitation Room was converted into six mini-clinics where residents were provided free primary care assessments that included blood pressure checks, glucose testing, body mass index, physicals, mental health assessments, and referrals to a private physician, or private and public clinics. The event was held by a traveling health care team lead by Texas A&M International University in collaboration with its partners, Border Region Behavioral Health Center, and City of Laredo Health Department. Twenty residents participated.